Here's how to make a perfect bouquet with pickles for Feb. 14 ... or any other day that hunger strikes. Valentine's Day is coming, and it's a really big dill. A great time to remind loved ones (spouses, moms, dads, dates, baes and kids included) just how much they really mean to you, the day calls for kind sentiments and thoughtful presents. Though a card or some roses may fit the bill, why not go the extra step this Feb. 14 and gift an edible bouquet made out of ... pickles?! 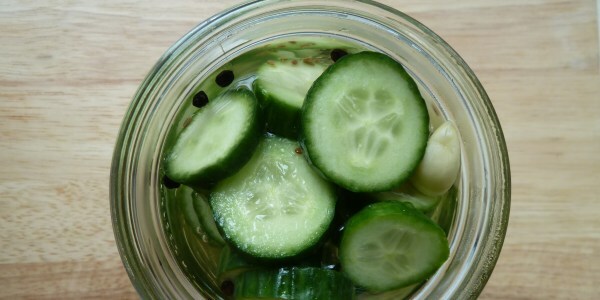 Sure, fresh flowers may smell like fairies bathing in a glistening glen, but pickles are also pretty magical. Plus, pizza bouquets are so last season. A pickle can be sweet, or it can be sour (anyone else drawing a parallel to love? ), but best of all, it won't wilt over time ... as long as it's eaten quickly. Grillo's Pickles, the Boston-based pickle company behind the novel idea, isn't actually selling premade pickle bouquets, but its founder told TODAY Food why the brand wants its loyal followers to make their own this year. "Not only is a pickle bouquet more beautiful than a dozen red roses, and healthier than a standard box of chocolate, it’s also far more creative," Grillo's founder and CEO, Travis Grillo, told TODAY. "Grillo’s Hot Italian Dill pickles make it easy for consumers to spice things up with their hottie, while the brand’s Bread & Butter pickles offer a low-cal treat for sweeties nationwide." Grillo said that his team drew inspiration for the bouquet from the traditional, 100-year-old Italian family recipe the company still uses today: cucumbers, salt, dill, garlic, water, grape leaves and vinegar. That's why they added whole bulbs of garlic and fresh dill to enhance the arrangement. But it's important to note that the bouquet Grillo's created is just for show and should not be copied exactly since it contains lilies of the valley, which are highly poisonous flowers. "We know there are a lot of pickle lovers out there that would love nothing more than to get a Valentine’s Day gift loaded with their favorite snack," Grillo added. If reactions on Twitter are any indication about the true popularity of pickles, Grillo is spot on. 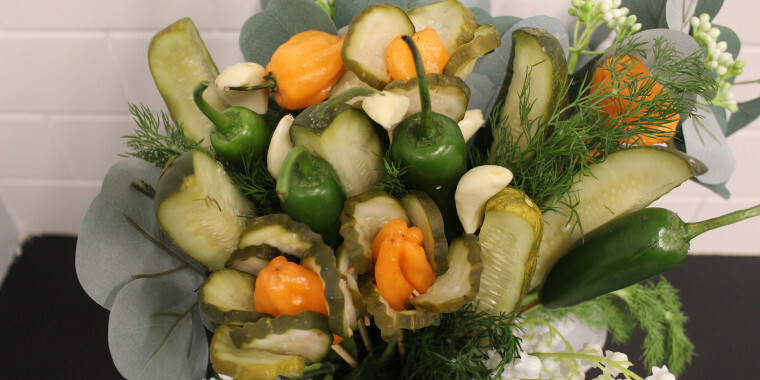 For years, pickle fiends have been fantasizing about a tangy edible arrangement. Some noted that receiving such a gift would fill their hearts with joy. It's pretty clear that just flowers are unacceptable in 2019. Some people don't even care if the pickles are pretty. Since Valentine's Day is a holiday that celebrates love, it's probably best if the pickles are prepared to look pretty decent. Pick up a selection of your favorite pickles. Grillo's recommends using a few different kinds like dill, hot chips, bread-and-butter, and a variety of spears and whole pickles. Pierce the pickles using bamboo kebab skewers to create a "stem" for each pickle. Once you have a sizable selection, arrange the speared pickles in a glass vase. Keep in mind that pickles are considerably heavier than flowers, so they will likely need some support. Use toothpicks to add any extra touches, like smaller pickle chips. Garnish with your choice of more edible festive foods, like fresh herbs or colorful peppers. And if you really want to try your hand at craftiness, try rolling little slices of pizza into the arrangement. After all, pickle-topped pizza has won over pickle fans in the past. Just don't give one to Gordon Ramsay. Erica Chayes Wida is a New York City-area based journalist and food writer obsessed with culture, poetry and travel. Follow her work on Contently.